Essential oils for hair can help promote healthy hair and scalp; and skin. Create beauty from the inside out! Do you want radiant, healthy looking hair? Every time I walk into get my hair cut, my stylist always says how wonderful my hair looks and feels! So, my suggestion is, in addition to using the oils, review that list and determine if there is something else you need to do to support having healthy hair and scalp. This may be as simple as drinking more water! Did you know that most shampoos, hair and skincare products on the market contain synthetic materials that create many of our hair, scalp and skin challenges? Propylene Glycol - may causes dry skin and skin irritation. Oleyl betaine – may cause dry hair and scalp. Mineral oils - petroleum products clog pores! Yes, the molecule is too big to be absorbed by the skin. So, check your labels, you may be surprised! If your shampoo has a pH between 4 and 6 and doesn't have synthetic compounds it's supportive to healthy hair growth. 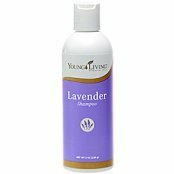 There are great natural hair products on the market that contain essential oils including the AromaSilk line by Young Living. These are the only products I will use! If you are adventurous, make them at home by using a base shampoo and adding oils that are right for your hair type. I usually add 3 to 5 drops of each essential oil to the shampoo directly or in a tablespoon of shampoo in my hand. No problem, below you will find the information on all the hair types and the corresponding oils. Also, provided is the carrier or base oils that are best for your hair type. Or Check out the Essential Oils fo Hair Chart. Normal hair is neither greasy nor dry, has not been permed or colored, holds its style and is usually shiny. The best base or carrier oils to use are jojoba, almond or borage. Dry hair looks dull, tangles easily and can become easily split at the ends. Therefore, we want essential oils for hair that stimulate the sebaceous glands in the scalp to produce more oil! The top base or carrier oils to use are almond, sesame, jojoba, borage, cocoa butter or avocado. Oily hair looks greasy and these oils are are best for oily hair. The top base or carrier oils are sesame, jojoba and borage. Other Hair Challenges? Need to Cleanse the Hair? No problem, here are my recommendations. Use a cleansing shampoo or cleansing oils first before you start. This will remove the buildup of chlorine, grease and chemicals in your hair and scalp. Use until you feel there is improvement. Start to include or use oils that support healthy hair next. I use a KidScents Natural Essential Oil Shampoo with lemon, tangerine, and MSM for gentle cleansing. Essential oils may be very effective in minimizing occasional flakiness. Melaleucca alternifolia Essential Oil or Tea Tree oil. The top base or carrier oils to use are jojoba and borage.